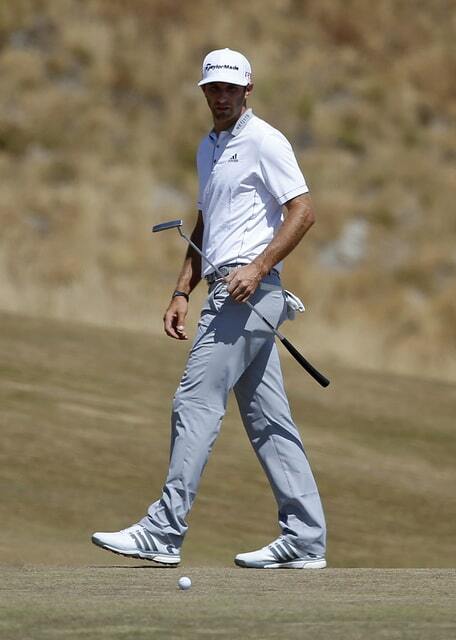 UNIVERSITY PLACE, Wash. — Dustin Johnson had his baby in his arms, a smile of sorts frozen on his face. There would be plenty of time later to sort through the pain and the what-ifs. Still in shock from the events of a few moments earlier, he walked from the 18th green, holding little Tatum, with fiancee Paulina Gretzky lending a comforting hand on his back. The U.S. Open would have been his had he made a 12-footer on the final green. An 18-hole playoff with Jordan Spieth would have been scheduled for Monday with a 3-footer coming back. He missed both, and one of the most dramatic U.S. Opens ended in the worst way imaginable. The cruelest of games had dealt Johnson the cruelest of blows. Instead of holding the Open trophy on the 18th green, he was looking for a quick exit from the chamber of horrors that was Chambers Bay. Instead of resting up for an 18-hole playoff on Monday, he was heading home wondering how it could have all gone wrong. He tried to keep it in perspective the only way he knew how. That a long week at Chambers Bay ended on such a sour note wasn’t lost on Johnson. He skipped the trophy ceremony and didn’t come into the media center to answer questions, though he did spend some time signing autographs for kids before leaving. He had put himself in position with a great birdie on the 17th hole when it seemed as if Spieth wouldn’t be caught. Then he hit a massive drive and 5-iron to the final green that were striped to perfection. The putt was above the hole and it wasn’t easy. No putts were easy on the bumpy greens at Chambers Bay that were crusty in the early evening sun. By the time the ball had finally stopped rolling it was a bit over 3 feet past the hole. Johnson wasted little time — just 48 seconds before he made his stroke — with the second putt, drawing a gasp from the 6,000 in the bleachers around the 18th green as it slipped by left of the hole. Johnson had seemingly shot himself out of the tournament with a series of missed putts after taking a two-shot lead at the turn. Back-to-back bogeys on Nos. 10 and 11 and a missed birdie opportunity on the driveable par-4 12th appeared to doom his chances. But Spieth hit his worst shot of the tournament on the par-3 17th, making double bogey right on front of him. And Johnson hit an iron to 5-feet and calmly made the putt to briefly tie for the lead. With Spieth making a great birdie of his own to regain the lead on 18, Johnson hit a huge drive down the middle, and then laced a 5-iron to within 12 feet to set himself up for his first major championship. Make the putt and he would have exorcised the demons of an Open he threw away at Pebble Beach in 2010. Make it and people would have stopped asking why he took a long break from the PGA Tour to deal with what he vaguely described as personal issues. But Johnson missed. And his first major championship was not to be.